In our final BCS conference SDPI examination of the 2011 college football season, we come to the SEC, home of the last six national champions, and the home to both participants in the 2011 BCS National Championship Game. To see last year's post on the SEC, click here. This first paragraph will explain how SDPI is calculated. So if you want the meat of this article skip on down. In the 2011 SEC regular season, conference play only, championship game excluded, the average SEC team gained and allowed 2612.33 yards. The standard deviation for yards gained (offense) was 511.33 yards. The standard deviation for yards allowed (defense) was 633.43 yards. Arkansas gained 3217 yards and allowed 2912 yards. Their offensive SDPI was 1.18 = [(3217-2612.33)/511.33]. Their defensive SDPI was -0.47 = [(2612.33-2912)/633.43]. Their total SDPI was 0.71. This number ranked 5th in the SEC. 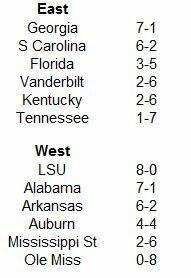 Here are the 2011 SEC standings. Now here are the 2011 SEC SDPI standings. The standings are sorted by division by total SDPI with ranking for each category (out of 12 teams) in parentheses. 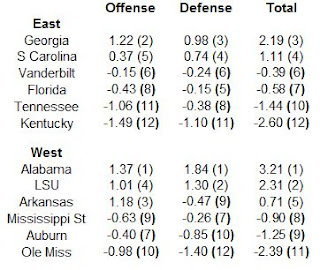 Statistically, Alabama was head and shoulders above the rest of the league. Unfortunately, their kicking errors and lack of success in the red zone allowed LSU to win the SEC championship. Fortunately for them, enough upsets occurred elsewhere in college football to allow them a rematch with the Tigers in the BCS National Championship Game. And the rest, as they say, is history. Vanderbilt qualified for a bowl game in James Franklin's first season as head coach, but their 2-6 SEC record was not indicative of their play. The Commodores were a hard-luck 0-4 in one-score games, losing close contests in Nashville to Georgia and Arkansas and on the road to Florida and Tennessee. Vanderbilt was also exceptionally dominant in their two league wins, beating Ole Miss and Kentucky by a combined 53 points. The easy answer here is LSU as the Tigers did not have the statistical profile of an unbeaten team. However, the correct answer is the other Tigers from Auburn. Auburn's four SEC wins came by a combined 39 points. Their four SEC losses came by a combined 125 points. Team's that post Auburn's statistical profile typically win about two of eight conference games. All things being equal, they should have switched records with Vanderbilt in 2011. Even when they posted back-to-back 8-0 SEC records in 2008 and 2009, the Crimson Tide only finished fifth in offense in the conference. The 2011 offense was incredibly consistent, gaining between 366 and 437 yards six times in their eight league games. After losing quarterback Mike Hartline and receiver Randall Cobb from the third ranked SEC offense in 2010, the Wildcats plummeted to the worst offense in the conference. The Wildcats were held to ten or fewer points in six of their eight league games! The Tide were uber-dominant on this side of the ball. Five of their eight SEC opponents were held below 200 yards and no team gained more than 239 yards against them! Facing the top-four offenses in the conference (Alabama, Georgia, Arkansas, and LSU) didn't help their numbers, but the Rebels were bad anyway you slice it. Remember, they gave up 30 points to the worst SEC offense (Kentucky). As you may have heard, the Arkansas Razorbacks have experienced a change in their head coaching position. I won't dwell on the circumstances surrounding the ouster of Bobby Petrino, but a cursory Google search should lead you to the story if you've been out of the loop. However, I will focus on his replacement, one John L Smith. Arkansas marks Smith's sixth destination as a head coach. Smith previously coached at Idaho (when they were IAA), Utah State, Louisville, Michigan State, and Weber State (more on that later). I am of the opinion that Arkansas could not have done much worse in their search for a replacement for Mr. Petrino. I will let you know up front, what follows is a hugely biased hatchet job, not unlike the Fox News special report on gas prices that aired a few weeks ago. However, unlike Fox News, I admit my biases. Why do I have such disdain for Mr. Smith? Primarily because I feel that much like Greg Norman at a golf tournament, John L Smith finds a way to lose. I believe that his teams constantly underachieved relative to their talent level. How can one go about determining whether or not a team under or overperformed? 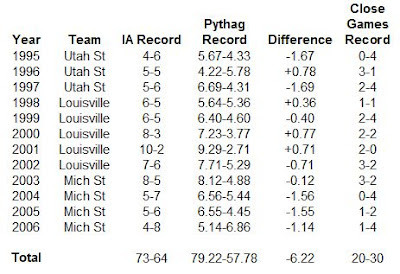 One way is to look at a team's Pythagorean Record. A team's Pythagorean Record is their predicted record based on the ratio of the points they scored to the points they allowed. First developed by Bill James for use in baseball, a team's Pythagorean Record can give us a pretty good approximation of a team's record. With that in mind, I looked at the IA teams coached by John L Smith in the 12 seasons from 1995-2006. I took each of his team's record against IA foes and compared it to their expected record based on the Pythagorean Theorem. For fun, I also calculated each team's record in one-score games. The table below summarizes the results. In 12 seasons, Smith's teams finished a little more than six games worse than where we would have expected them to finish based on their points scored and allowed. Is this a huge difference? I don't know. To answer this question, we would need to calculate how other coaches have performed relative to their Pythagorean Record over an extended period of time. Perhaps one day I shall embark on that brave undertaking. For now though, we can say that his teams underperformed their Pythagorean Record over 12 seasons and 137 games (a relatively large sample). His teams drastically underperformed during his four seasons in East Lansing, finishing over four games below where they would have been expected to finish based on their scoring ratios. In addition, over a relatively healthy sample size of 50 games, his teams won just 40% of their one-score contests (20-30 record). In addition to the Pythagorean numbers, I also examined the results for each game Mr. Smith coached over those 12 seasons to see if I could find any head-scratching results. I found a few. In 1995, his Utah State Aggies lost to Boise State when the Broncos were still a IAA team. In 1997, his bowl bound Utah State Aggies lost to a North Texas team that finished 4-7. His second Louisville team lost to a 3-9 Army squad 52-59. Army scored just 225 points that whole season and were shut out twice. His first Michigan State team lost at home to a 5-7 Louisiana Tech squad in 2003. His 2004 team missed out on a bowl because they lost the season opener to Rutgers. Rutgers finished 4-7 that season and lost the very next week to IAA New Hampshire. That same Spartan team also provided one of the few bright spots in Tyrone Willingham's final season as coach of Notre Dame as the Irish beat Michigan State in east Lansing en route to a 6-6 record. Michigan State also lost to Penn State in 2004. As you may not remember, that Penn State team went just 4-7 and prior to their 37 point outburst against the Spartans, the Nittany Lions had averaged just a shade over 9 points per game in their first seven Big 10 games. 2005 featured this historic meltdown that can't be put into words. Finally, in his Michigan State swan song, his charges blew a huge lead at home against Notre Dame and also lost by 25 points to an Indiana team that finished 5-7.Of course, I'll admit, if you look hard enough, you can find some fantastic performance from his teams, like the greatest comeback in college football history. On the other hand, what are you doing trailing Northwestern by 35 points in the first place? Finally, while I obviously don't know Smith personally, his dealings with his employers have been less than forthright. He allegedly accepted the Michigan State job at halftime of Louisville's 2002 bowl game. He also left Weber State hanging by accepting the Arkansas job before coaching a game for the Wildcats.We'll see how Smith does with the great talent on hand at Arkansas, but consider me extremely skeptical of this coaching hire. This week in our SDPI journey, we attempt to shed our east-coast bias and examine the Pac-12. To see last year's post on what was then known as the Pac-10, click here. This first paragraph will explain how SDPI is calculated. So if you want the meat of this article skip on down. In the 2011 Pac-12 regular season, conference play only, championship game excluded, the average Pac-12 team gained and allowed 3707.75 yards. The standard deviation for yards gained (offense) was 569.97 yards. The standard deviation for yards allowed (defense) was 392.36 yards. Cal gained 3656 yards and allowed 3225 yards. Their offensive SDPI was -0.09 = [(3656-3707.75)/569.97]. Their defensive SDPI was 1.23 = [(3707.75-3225)/392.36]. Their total SDPI was 1.14. This number ranked 3rd in the Pac-12. Here are the 2011 Pac-12 standings. 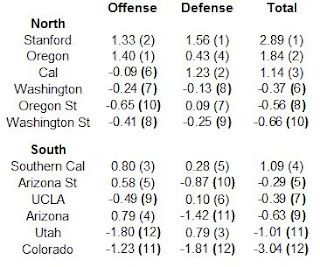 Now here are the 2011 Pac-12 SDPI standings. The standings are sorted by division by total SDPI with ranking for each category (out of 12 teams) in parentheses. In 2011, the Pac-12 was a top heavy league, both in national reputation and actual performance. Three teams (Oregon, Stanford, and Southern Cal) finished the season ranked in the top-10, but no other team was ranked in the top-25. 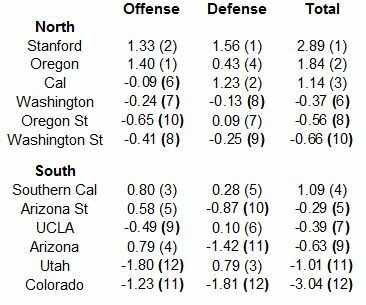 Similarly, four teams (Stanford, Oregon, Southern Cal, and Cal) finished with SDPI ratings over 1.00. However, none of the other eight teams finished with a positive SDPI rating. The two newcomers to the conference suffered the indignity of finishing eleventh and twelfth in the conference in SDPI. The California Golden Bears finished with a losing conference record despite boasting one of the strongest defenses in the conference. Why did the Bears have a relatively grisly record, at least compared to their statistical profile? One reason is schedule strength. The Bears were unfortunate to reside in the same division as the top-two teams in the conference, Stanford and Oregon. The Bears also had to face the third best team (Southern Cal) in one of their games against the Pac-12 South. Another reason related to schedule strength is their road schedule. 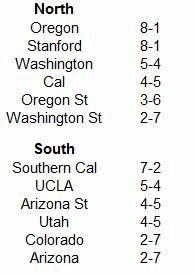 The Pac-12 plays a nine-game conference schedule (it has played one since 2006) and thus every other year each team must face five road games while playing just four at home. The Bears had five league road games in 2011 and went just 1-4 in those games, while going 3-1 at home. The third and final reason has to do with one-score games. The Bears played in just two one-score games in 2011, losing both. Those three facts coupled with the small sample of size of a nine-game season conspired to make Cal, a team that could very well have gone 6-3 or 7-2 in the Pac-12, to go a somewhat disappointing 4-5. The UCLA Bruins didn't do anything particularly well in 2011, yet thanks to some close game luck and some prior indiscretions at Southern Cal, they won the Pac-12 South. Over the course of their nine conference games, UCLA was outscored by 69 points. However, in one-score games they managed a perfect 3-0 record and earned the honor...of becoming a 6-8 bowl team? This is becoming old hat for Chip Kelly. The Ducks have posted the best offense in the conference each season he has been either offensive coordinator or head coach (2007-present). It was not a banner season for the Utes in their first trek through a BCS conference. The Utes were held below 400 yards in each of their nine conference games, topping out at 358 yards against Washington State. The Cardinal were very consistent on the year, holding seven of nine league opponents (including Oregon) under 400 yards. The Buffaloes put things together in their final game, holding Utah (the league's worst offense) to 274 yards. That was about 244 yards less than they allowed to conference foes going into that game. Since 2008, only four Pac-10/12 teams have finished the season ranked in the AP top-25. 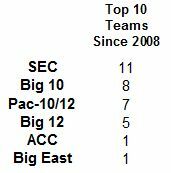 Among the six BCS conferences, that is second to last, ahead of only the Big East (which has had two and four fewer teams than the Pac-10/12 in that span). The mighty SEC reigns supreme in this category, boasting 19 top-25 teams in that span, with the Big 12, Big 10, and ACC lagging behind, but still far ahead of the Pac-10/12 and the Big East. However, when we look at teams that have finished the season ranked in the AP top-10, the Pac-10/12 has fared much better. Their seven top-10 teams rank third behind the SEC with an incomparable 11 and the Big 10 with eight. Framed another way, 70% of the Pac-10/12 teams that have finished the season ranked in the AP top-25 since 2008 have finished in the top-10. That is by far the highest percentage of any of the six BCS conferences. 2011 was a perfect microcosm for how the Pac-10/12 has played out the past four season. The conference finished with three teams ranked in the top-10 (Oregon, Southern Cal, and Stanford), but no other teams ranked in the top-25. 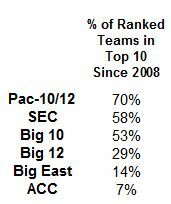 Since 2008, the Pac-10/12 has been dominated by those three teams, but has had a dearth of mid-level teams. In my opinion, this has harmed the league's credibility on a national scale, as many casual observers discount the accomplishments of the Big 3 because they see no other Pac-10/12 schools ranked in the top-25. Dear reader, don't fall prey to this east coast elitist bias. Oregon, Southern Cal, and Stanford have each produced several elite seasons in the past four years and deserve, nay demand your genuflection. We're already halfway through the BCS conferences on our SDPI-guided journey through the 2011 college football season. We'll turn the corner after this week's edition where we examine the Big 12. To see last year's post on the Big 12, click here. This first paragraph will explain how SDPI is calculated. So if you want the meat of this article skip on down. In the 2011 Big 12 regular season, conference play only, the average Big 12 team gained and allowed 4008.3 yards. The standard deviation for yards gained (offense) was 808.47 yards. The standard deviation for yards allowed (defense) was 518.18 yards. Iowa State gained 3572 yards and allowed 4095 yards. Their offensive SDPI was -0.54 = [(3572-4008.3)/808.47]. Their defensive SDPI was -0.17 = [(4008.3-4095)/518.18]. Their total SDPI was -0.71. This number ranked 7th in the Big 12. Here are the 2011 Big 12 standings. 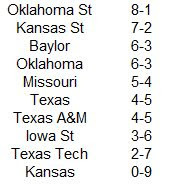 Now here are the 2011 Big 12 SDPI standings. The standings are sorted by total SDPI with ranking for each category (out of 10 teams) in parentheses. The 2011 season marked the first season of Big 12 play sans divisions as Colorado and Nebraska departed for the Pac-12 and Big 10 respectively. 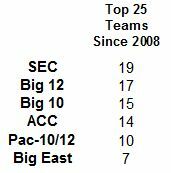 2011 also marked the first time since 2003 that a team other than Oklahoma or Texas won the Big 12 title. The conference title was Oklahoma State's first since 1976, and their first outright conference title since 1948 when they were in the Missouri Valley! Elsewhere in the standings, Kansas became the first Big 12 team to go winless in the conference since Iowa State in 2008. Despite very solid peripherals (top-four on both sides of the ball), Texas A&M endured a losing season in the conference and got their coach fired. The Aggies were 1-4 in one-score games in the conference, with their lone non-competitive loss coming at Oklahoma. Perhaps most disheartening for the Aggies was that they had double-digit leads in each of those close conference losses. They led Oklahoma State by 17 points at halftime, Missouri by 14 in the second quarter, Kansas State by 14 in the second quarter, and Texas by 13 in the second quarter. The Aggies should see their luck change a little in 2012, but unfortunately for them, they will be plying their trade in the take-no-prisoners SEC West. Good luck with that. Kansas State had their best conference finish since winning the Big 12 in 2003. However, six of their seven wins came by seven points or fewer. In fact, despite winning nine of their seven conference games, the Wildcats outscored their league opponents by just nine total points. Not only did they have exceptional luck in close games, the Wildcats also finished with a +13 turnover margin in league play (second best). The Wildcats are a unanimous choice by statistical indicators to regress in 2012. Led by a Heisman-winning quarterback who looked a little like Terence Trent D'Arby, the Bears ran roughshod over Big 12 defenses. They gained over 600 yards in five of their nine league games and were never held below 429 yards. With Robert Griffin and Kendall Wright both heading to the NFL, the Bears better find a wishing well if they want to recreate their success in 2012. How do you say something nice about something this terrible? Here goes: In their final four conference games, the Jayhawks allowed over 500 yards just once after allowing that many four times in their first five games. The Texas defense is a shade overrated thanks to their performance against Kansas when they allowed just 46 yards to the Jayhawks! Take away that awesome showing and credit the Jayhawks with an average performance and Texas still boasts the best defense in the conference, albeit one that is not otherworldly. The Bears needed each and every yard and point their magnificent offense gained thanks to a defense that was in hibernation. As most college football observers know, the Big 12 will have lost two (more) league members when the football season begins in the fall. Missouri and Texas A&M are on their way to the SEC. In their place, the league has added a mid-major power in TCU and the dominant Big East program of the last half-decade in West Virgina. How do these two newcomers compare to the two programs that headed east? To find out, I looked at the SRS ratings of the four schools for the past five seasons (2007-2011). The SRS rating is a quick and dirty rating system utilized by college football reference dot com. It estimates how many points a team is better than average. 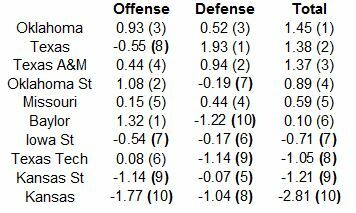 The table below lists the four teams and their respective SRS ratings from 2007-2011 with their SRS national rankings in parentheses and a weighted average national ranking (with most recent seasons counting more heavily). As you can see, based on weighted national ranking, the Big 12 appears to be getting a minor upgrade. 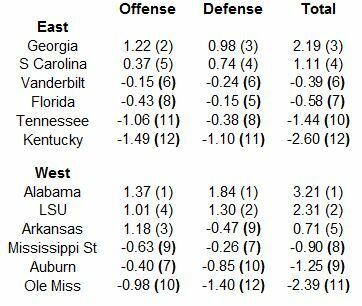 However, based on the way Texas A&M is trending and the relative stagnation of the West Virginia program, I would call the new additions a wash. In our SDPI jaunt through college football, we now head to the midwest. Home of dairy, corn, and some pretty good football in 2011. To check out last year's post on the Big 10, click here. This first paragraph will explain how SDPI is calculated. So if you want the meat of this article skip on down. In the 2011 Big 10 regular season, conference play only, championship game excluded, the average Big 10 team gained and allowed 2904.167 yards. The standard deviation for yards gained (offense) was 410.08 yards. The standard deviation for yards allowed (defense) was 502.52 yards. Penn State gained 2759 yards and allowed 2615 yards. Their offensive SDPI was -0.35 = [(2759-2904.167)/410.08]. Their defensive SDPI was 0.58 = [(2904.167-2615)/502.52]. Their total SDPI was 0.22. This number ranked 7th in the Big 10. 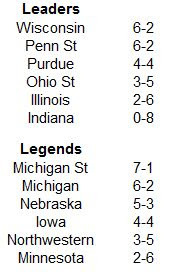 Here are the 2011 Big 10 standings. Now here are the 2011 Big 10 SDPI standings. The standings are sorted by division by total SDPI with ranking for each category (out of 12 teams) in parentheses. The Big 10 began divisional play in 2011 and thanks to a late roughing the punter penalty, the best team in the conference (Wisconsin) survived and advanced to the Rose Bowl. The second best team by SDPI (Michigan) received an at-large BCS bid to the Sugar Bowl. All told, the Big 10 boasted ten bowl teams, with only Indiana and Minnesota missing out on the postseason. The new format did produce some interesting results. Indiana became the first Big 10 team to go winless in conference play since Minnesota in 2007 (also under a first year coach), while Wisconsin became the first Big 10 champion to lose more than one conference game since the Purdue/Michigan/Northwestern logjam in 2000! Outside of Wisconsin, SDPI viewed Illinois as the class of the Leaders Division, ranking them fourth overall. Alas, the Illini committed a league-high 21 turnovers in their eight conference games en route to a league worst turnover margin of -10. Their offense not only turned the ball over frequently, they also had trouble scoring points. In their final six conference games (all losses), the Illini were held to seven points three times, and never managed to top 17 points in any game. On a related note, the Illini changed coaches this offseason. Penn State stayed in contention for the Leaders Division crown until the last weekend of the regular season despite an offense that appeared to be using the playbook of Walter Camp. The Nittany Lions were the anti-Illini. Neither team could score, and both played solid to good defense. However, the Nittany Lions did a better job of holding onto the football (15 turnovers in Big 10 play) and forcing turnovers (17 in Big 10 play). They also fared well in one-score games, going 4-1 in such conference contests. As you may have heard, the Nittany Lions will have a new coach in 2012, and he doesn't step into a great situation. Russell Wilson fit like a glove, giving the always vaunted running attack a complimentary piece throwing the ball. Don't let the conference records fool you, the 2011 team (6-2) was better than the 2010 team (7-1) on both sides of the ball. The Gophers were held below 300 yards of offense in half their conference games. However, the running game did show signs of life late in the season, as the Gophers channeled a little Glen Mason in averaging 259 yards on the ground against Northwestern and Illinois in their final two games. The Illini and Badgers allowed the exact same number of yards to Big 10 foes. The Badgers pulled double duty, possessing both the league's top offense and defense. 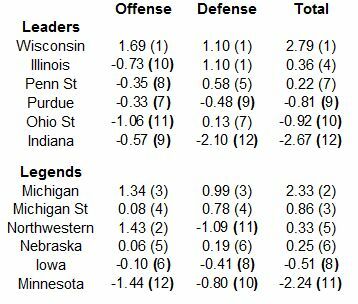 However, while their offense was one of the best the Big 10 has seen in years, their defense was the worst to rank number in the conference in the seven years (2005-2011) I have been tracking SDPI. That relatively pedestrian defense was torn asunder in the Rose Bowl by Oregon, allowing 621 yards and 45 points to the Ducks. The Hoosiers allowed every conference foe to top at least 400 yards against them and allowed at least 30 points in seven of eight conference games. Michigan State has gone a collective 14-2 against the Big 10 the past two seasons, yet has as many BCS bowl appearances in those two seasons as Indiana who is 1-15 that span. Like Salieri in the film Amadeus, the Spartans have been very good, but their rise has not been timely. In 2010, they finished in a three-way tie for first with Wisconsin and Ohio State, but were denied a BCS berth. In 2011, the Spartans won the Legends Division, but lost a close game in the inaugural Big 10 Championship Game to Wisconsin and were denied an at-large BCS berth. To make matters worse, the Spartans are actually 3-1 against Big 10 BCS bowl teams over the past two seasons, beating Wisconsin in 2010, Michigan in 2011, and splitting with Wisconsin in 2011. I wanted to see how hard luck the Spartans had been, so I looked at the six BCS conferences since 1998 (the first year of the BCS) to see if any teams had similar gaudy records and no BCS bowl games to show for it. The Spartans are in rare company. Kansas State had by far the most glossy two-year record to never be invited to a BCS bowl. The Wildcats finished the 1998 regular season unbeaten in the Big 12 and overall, but lost the Big 12 Championship Game in overtime and were relegated to the Alamo Bowl. In 1999, they lost only to eventual Big 12 champion Nebraska, and settled for the Holiday Bowl. Only one other team finished with a conference record equal to Michigan State's over a two-year period. Texas went 7-1 in the Big 12 in 2000, but their one loss was to the undefeated and eventual national champion Oklahoma Sooners. An additional regular season loss to Stanford consigned them to the Holiday Bowl. Texas finished the 2001 season 7-1 in the Big 12 and were heavy favorites over Colorado in the Big 12 Championship Game. They were upset and again settled for the Holiday Bowl. Only two other teams have been as unfortunate as the Spartans when it comes to winning a lot of games over a two-year period and being shut out of a BCS bowl. It should also be noted that those two teams played in an era prior to 2006 when there were only four BCS bowls instead of five and thus two fewer slots. In the second installment of our SDPI sojourns, we take a look at the Big East, a conference that will be changing somewhat in 2012 (swapping out West Virginia for Temple) and then undergoing dramatic changes in 2013. For now though, we will focus on the present, or more accurately the recent past. To check out last year's SDPI post on the Big East, click here. This first paragraph will explain how SDPI is calculated. So if you want the meat of this article skip on down. In the 2011 Big East regular season, conference play only, the average Big East team gained and allowed 2522.375 yards. The standard deviation for yards gained (offense) was 333.95 yards. The standard deviation for yards allowed (defense) was 189.47 yards. Cincinnati gained 2519 yards and allowed 2595 yards. Their offensive SDPI was -0.01 = [(2519-2522.375)/333.95]. Their defensive SDPI was -0.38 = [(2522.375-2595)/189.47]. Their total SDPI was -0.39. This number ranked 6th in the Big East. Here are the 2011 Big East standings. Now here are the 2011 Big East SDPI standings. The standings are sorted by total SDPI with ranking for each category (out of 8 teams) in parentheses. In their final season as Big East members, West Virginia won a three-way tiebreaker with Cincinnati and Louisville to nab the conference's automatic bid to the Orange Bowl. In that game, the Mountaineers trounced ACC champion Clemson, moving the ball seemingly at will in accumulating 70 points. The game marked their first foray into a BCS game since Rich Rodriguez left for Michigan following the 2007 regular season. The Mountaineers have dominated the Big East since the league's current incarnation in surfaced in 2005, and their departure leaves this the most wide open BCS conference race in 2012. South Florida finished tied with Syracuse in the basement of the Big East, winning just once in seven conference games. However, outside of a non-competitive game against Pitt (lost 44-17), the Bulls played well enough to win in their other five league losses. The Bulls lost three games by a field goal each against Cincinnati, Rutgers, and West Virginia. For good measure, they also lost by six to Connecticut. 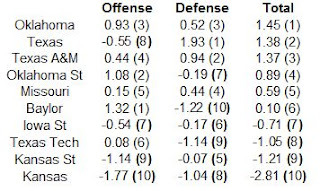 South Florida also posted the league's worst in-conference turnover margin at -6. None of these facts will change the way the 2011 season played out, but it does mean South Florida is likely due for marked improvement in 2012. Both teams that finished tied with West Virginia at the top of the league were very fortunate to do so. Cincinnati and Louisville both posted middling peripherals, ranking sixth and seventh respectively in overall SDPI. 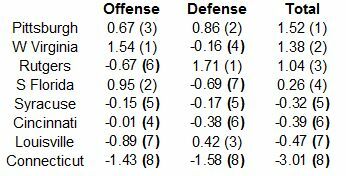 In fact, Louisville's defense was the only facet of either team that was better than the Big East average. Both teams did go a combined 5-2 in one-score games, aiding them in their pursuit of a championship. Offensive coordinator turned head coach Dana Holgorsen did what he was paid to do. The Mountaineers topped 400 yards in five of their seven Big East games. For good measure, they moved the ball quite well against one of the nation's best defenses in the non-conference, amassing 533 yards against LSU. The Huskies never gained more than 329 yards in Big East play and were held below 300 yards four times. One season after being the worst in the Big East, the Scarlet Knights improved dramatically. They held four of their seven Big East foes under 300 yards and only West Virginia was able to consistently move the ball against them (gaining 428 yards). The Huskies pulled double duty, pairing the worst offense in the league with the worst defense. Outside of a stalwart defensive showing against Louisville (allowed 299 yards), the Huskies showed little resistance. Yet somehow a team with the worst offense and defense in the conference managed to win three of seven games. Following the 2004 season, the Big East kicked the Temple Owls out of the conference. After spending 14 seasons in the conference and never winning more than four games in any one of them, you could understand the league's logic. Temple spent two seasons as a IA nomad without a conference, winning just a single game (it was against Bowling Green) in those two seasons. However, the Owls made a good hire while they were an independent, tabbing Al Golden to be their coach. Golden took the reins in 2006 and went 1-11. The Owls joined the MAC in 2007, and their fortunes shifted. They won four games, then five in 2008, and then nine in 2009 (while also qualifying for their first bowl game in nearly 30 years). They were bowl eligible again with eight wins in 2010, but like Alanis Morissette, were uninvited to the postseason. Golden left for Miami after the 2010 season, but the Owls continued their run of success under his successor Steve Addazio, winning nine games, including just their second ever bowl game. And wouldn't you know it, their old girlfriend noticed. Having just been dumped by West Virgina and needing an eighth date to the box social, the Big East invited Temple back into the fold. The Owls have truly come full circle. From BCS conference laughing stock, to worst team in IA, to MAC power, back to a BCS conference, this time as a reasonable contender. How reasonable are the Owls as a contender? 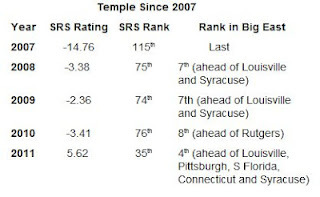 The table below lists Temple's SRS ratings (per college football reference) since 2007. The SRS is a quick and dirty way of rating teams based on who they played and how much they won or lost by. It basically measures a team as the number of points above or below average they are. In any given season, the very best teams in college football are usually +20. The table also lists their SRS national rank and where they would have ranked in the Big East. As you can see, while the Owls may have been a MAC power, they were below average when compared to the rest of IA from 2007-2010. Their 2011 season was solid, but still they would have ranked just fourth in the Big East. Temple is certainly a program on the rise, especially considering where they were just five seasons ago, but they may experience some growing pains in moving to a BCS conference, even one that lacks a true powerhouse team like the Big East.